Faster Cleaning – Dissolves even hardened grease and oil deposits instantly. More Powerful – Cuts through accumulated sludge on machinery metal parts… dissolves dirt, soot, grease and grime deposits on road equipment… makes short work of hardened grease and oil deposits on concrete floors. More Economical – Dilute it. So super concentrated, a 1 to 10 ration can tackle the toughest jobs. Use a 1 to 20 ratio for most daily maintenance tasks. Safer to Use – Non- flammable for safer storage. Non-polluting and biodegradable for safe disposal in sanitation systems. Rust inhibited for safe use on ferrous substances. Instant-action heavy-duty degreaser is especially formulated to tackle the dirtiest industrial cleaning tasks. Dissolves and emulsifies grease and grime immediately… even those hardened deposits on concrete floors. Cuts through accumulated sludge on machinery, road equipment, engines, and conveyors. Clean concrete floors and exhaust hoods. Use in dip-tanks for all non-aluminum metal cleaning processes. "Grease-Off" is economical to use. Dilutes with hot or cold water to suit the soil conditions. Though a 1 to 10 ratio is usually adequate for tough cleaning jobs, experiment with greater or lesser concentrations to determine which strength best suits the task. 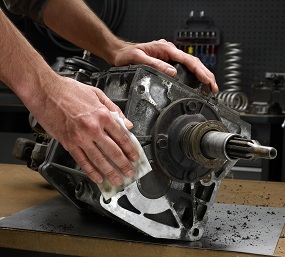 "Grease-Off" heavy-duty degreaser rinses easily with water, without leaving a film. May be applied with automatic scrubbers or conventional methods.